Daft Punk is an electronic music duo consisting of French musicians Guy-Manuel de Homem-Christo (born February 8, 1974) and Thomas Bangalter (born January 3, 1975). Daft Punk reached significant popularity in the late 1990s house movement in France and met with continued success in the years following, combining elements of house with synthpop. The duo is also credited with producing songs that are considered essential in the French house scene. Daft Punk's Thomas Bangalter and Guy-Manuel de Homem Christo are longtime friends, but in terms of their public personas, the French duo prefers to keep their identities secret by donning sci-fi costumes and wearing masks to let their music speak for itself--and fans have listened. Daft Punk's debut album Homework, "probably the greatest electronic disco record ever made" according an Entertainment Weekly critic, has sold more than two million copies, 400,000 of those in the duo's native France. The duo met at a Paris school as teenagers in 1987 and shared their passion for music, which four years later led to the formation of Darling, an instrumental indie pop band. Joined by Phillipe Zdar, who later created the similar-sounding Cassius, Darling found fleeting fame with a Beach Boys-style tune that was included on a compilation tape released by Stereolab's United Kingdom label, Duophonic. A reviewer for England's Melody Maker magazine dubbed Bangalter and Christo "daft punks" after listening to their first single. When Darling disbanded in 1993, Bangalter and Christo began exploring techno and house clubs, along with the rock-based techno of 1980s deejay Andrew Weatherall. Instead of experimenting in an expensive, big-name studio, they purchased recording equipment and, according to the English music newspaper New Musical Express (NME), "began producing heavy house music based on big hip-hop beats and boasting strange sounds, sirens and guitar-driven samples." After hearing Daft Punk's music, the Glasgow, Scotland-based Soma Records quickly signed the group and released its debut single "New Wave," called an "acidic mix of beats and basslines" by NME, in 1994. The following year, the song "Da Funk" hit BBC Radio 1 airwaves, capturing the attention of breakthrough electronica/trance deejays Chemical Brothers, who played the song during their sets. Three more singles--"Rollin' and Scratchin'," "Indo Silver Club" and "Alive"--followed, and the Chemical Brothers recruited Daft Punk to remix its song "Life is Sweet." Banking on Daft Punk's future success, Virgin Records inked a deal with the duo in 1996. As a teaser to the first record, Bangalter and Christo offered the track "Musique" to Virgin Records' Source Lab 2 compilation CD. While recording its debut, Daft Punk spread its musical wings. The duo remixed singer Gabrielle's song "Forget About the World," and rejoined Zdar for regular club appearances at Paris' Respect. In 1997, Daft Punk released its debut album, Homework, on Virgin and started a "U.K. invasion of French club music," according to NME. The pre-release hype helped push Homework into the top ten in the United Kingdom, but the album was largely ignored in France. In a review for CDNow, Kirsten Terry chalked up the success to Daft Punk's keen sense of humor: "If you're looking for a real challenge, try to be in a bad mood after listening to a Daft Punk album." 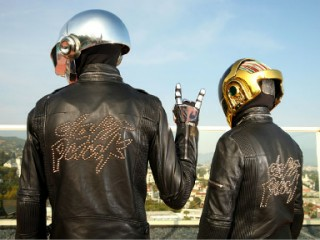 Furthering the duo's mysterious identities, Daft Punk did not appear in its videos, instead opting for young directors such as Spike Jonze, Michel Gondry, and Seb Janiak to create the pieces. In April, the single "Around the World" hit radio and clubs and found success in the United States by August of 1997 when it rose to number eight on Billboard's Hot Dance Music/Club Play charts. Though Daft Punk's popularity has mounted with music fans, the duo found opposition in what they believe are the French government's reactionary policies. "Right now, we've got some friends who are being charged with inciting people to take drugs," Bangalter said in comments included in the group's biography at its website. "They weren't even selling anything. They were just having a party. But in France these days they're saying that having a party is encouraging people to take drugs, booking a DJ is encouraging people to take drugs." The group spent 1998 creating and releasing the DVD D.A.F.T. : A Story About Dogs, Androids, Firemen and Tomatoes, a compilation of six videos from Homework, as well as exploring a variety of side projects. The most well known is Bangalter's Stardust which produced the club hit "Music Sounds Better With You" in 1998. For the next two years, the duo worked on its sophomore effort Discovery. In an interview with Peter Gaston for CDNow, Bangalter mocked his group's mysterious identity, saying a problem in the studio had turned he and his partner into robots, and therefore, no more masks were required. "In September 1999, we had this small explosion in our studio around the 9/9/99 computer bug where the sampler crashed and there was some accident--and then we just turned out to become robots. We look like robots, so we don't wear masks anymore." Discovery proved to be a success even before its release in March of 2001. The first single, "One More Time," which is similar musically to Stardust's "Music Sounds Better With You," was added to pop radio station and nightclub playlists around the United States in November of 2000. The song, which features the vocals of New York house deejay Romanthony, debuted at number one in France, number two in the United Kingdom, and number one on the Eurosingles charts. As with the first album, Daft Punk hired Japanese artist Leiji Matsumoto to design the animated video. In the same interview with CDNow, Bangalter said that Daft Punk tried to avoid rules about club music as strictly dancefloor or electronic to create a unique mix on Discovery: "We wanted to destroy those rules," and find a gap where "there would be maybe a place for electronic music that could have energy, and could mean something different with a lot of emotion and dynamics and energy." In 2001, Daft Punk decided not to tour in order to concentrate on Daft Club, an interactive website that allows fans who purchase the new record to download technology to read new content and hear remixes. "In order to express ourselves in a much more fun way, and in order for people to read art, listen to music in a more exciting way, because it's not down to just the CD itself," he told CDNow. Starting on September 13 and ending November 9, 2004, Daft Punk devoted six weeks to creating new material. The duo released the album Human After All in March 2005. Reviews were mixed, mostly citing its overly repetitive nature and seemingly rushed recording. The singles taken from this album were "Robot Rock", "Technologic", "Human After All", "The Prime Time of Your Life" and "The Brainwasher". The earliest official statement from Daft Punk concerning the album was "we believe that Human After All speaks for itself." On May 21, 2006, Daft Punk premiered their first directed film, Daft Punk's Electroma at the Cannes Film Festival sidebar Director's Fortnight. The film does not include their own music, which is a first for the duo considering their previous DVD and film releases (D.A.F.T. for Homework and Interstella 5555 for Discovery). Midnight screenings of the film were shown in Paris theaters starting from the end of March 2007. Initial public comments have since been positive. Soma Records released a previously unpublished Daft Punk track called "Drive" that was made during the same time the duo was still with Soma Records and recording "Rollin' and Scratchin'" and "Da Funk". The track was included in a 20th anniversary multi-artist compilation of the Soma label. In October 2011, Daft Punk placed 28th in a worldwide official poll of DJ Magazine after appearing at position 44 in the year before. On January 19, 2012, Daft Punk ranked #2 on Mixmag's Greatest Dance Acts of All Time, with The Prodigy at #1 by just a few points. Daft Punk is currently working on their forthcoming album in collaboration with singer-songwriter Paul Williams and Chic frontman Nile Rodgers. Williams mentioned the collaboration in two separate interviews, and that the project has been in production since 2010. During an interview with Rodgers, he stated that he would meet with Daft Punk to discuss the duo's upcoming album. Rodgers later said that he and Daft Punk had an informal jam session when they met, and that a formal collaboration would be undertaken. In an interview with Street Date Radio, Danger Mouse revealed that he will be producing the duo's upcoming album, reported to be released in 2013. Although Williams stated that Daft Punk's new album could be released as early as June 2012,it was later confirmed that this would not be the case.